Rokkan took the grand rosewood stairs three at a time, young Naetok trailing after him. He was invigorated by the afternoon ride and had been surprised to enjoy his little brother’s lively company. But their expedition outside the city gates had taken longer than he had planned. Shadows were already beginning to wreath the Great Hall. He slowed his breakneck pace, as his young half-brother scuttled after him. Together they proceeded along the atrium balcony and took the private stairs to the royal quarters. Spear wielding guards saluted them as they passed. He’d just drop Natu off into the care of Rianda or Anna before heading off to his own quarters to get ready for tonight’s feast. The Kapok would expect his sons to stand by him as the more important guests were ushered into the throne room before the banquet. And his father hated tardiness. As they passed the antechamber to his parents’ chambers, a wail cut through the soft patter of footsteps of hurrying servants and the murmur of the merchants and minor nobles beginning to assemble in the Great Hall. The high pitched voice began to crescendo into hysterical weeping. Naetok eyes lit up. ‘What’s happening?’ Not waiting for an answer, he darted through the open door and into the royal quarters. That kid was a magnet to trouble. With a sigh, Rokkan followed his brother into the fray. Rianda stood with her slender arms stiff at her side, her eyes pupils like dark pools in her green eyes. Her face was pale beneath the golden tan of her soft skin. Anna and another maid flurried around the room, lifting rugs and cushions and looking behind divans and pot plants. Kupanna Suraya stood at the other end of the room, cradling Lakwi in her arms. The little girl’s eyes were wide and her thumb stuck firmly in her mouth. ‘It’s okay Rianda. I’m sure it will turn up. 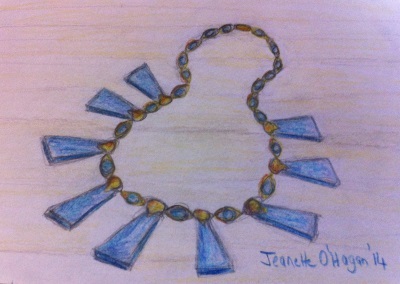 I can wear the jade necklace with the leaf pattern.’ Suraya turned and her eyes met Rokkan’s. A sudden gust of wind blew in through the open balcony doors, scattering a sheaf of parchment over the mosaic floor. Outside, the sky was darkening. Nesting mountain parrots screeched above the carolling of the tarrawongs and cooing of the mountain doves. Read Part Two: The Missing Necklace HERE.